Properties in Henry Whitfield State Museum average 4.8 out of 5 stars. Unique, refined-rustic suite in Stony Creek village. Property 6: Unique, refined-rustic suite in Stony Creek village. Property 7: Pet-Friendly Branford Home - 10Min Walk to Beach! Property 8: In-Town, 2 Bdroom! Tidal Marsh Views, 10 Minute Walk to Beach! LOCATION LOCATION.....-WALK TO EVERYTHING -ACROSS FROM RIVER- BEAUTIFUL VIEWS!!! Property 17: LOCATION LOCATION.....-WALK TO EVERYTHING -ACROSS FROM RIVER- BEAUTIFUL VIEWS!!! Property 22: Coastal Beach Apartment Old Saybrook CT.
Property 24: Luxurious New Loft!! We had a wonderful stay in New Haven at this Yale University close historic building penthouse with tons a character. The owner provided all the amenities of a full kitchen and a welcome package of snacks and sweets. The bedrooms are nicely appointed and have very comfortable beds. We enjoyed the table on the outdoor deck for breakfast with views of the church steeples of New Haven. Since we rented a car, it was great to have a designated parking space in the back. The neighborhood was nice and quite, but so close to the great restaurants and bars around surrounding New Haven Green. We are looking forward to a return stay in the fall. We absolutely loved our stay! 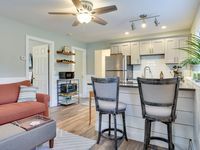 The home has everything you need and is tucked back where it&rsquo;s private and quite while still being a short drive into town and just a short walk from the beach. It&rsquo;s decorated so cute and is so clean and comfortable. Highly highly highly recommend staying here!